Down in Oaxaca, if you order a beer in a place fronting the zocalo, most likely your server will bring you a little treat with your beer. One of the common ones is this simple dish, which can be made as late as an hour or two before serving, although a few more hours of marinating is better. Take some tasty carrots. Peel (or not, if it’s carrot season or if their skins are particularly thin), then run through a food processor with the wider slicer blade to make coins that aren’t too thin. (Alternately, slice by hand.) Steam, boil, or microwave until somewhat soft, but not mushy. Drain and set aside to lose heat. In a bowl large enough to hold the carrots, put in some mild vinegar. I use white or apple cider, or sometimes white balsamic. 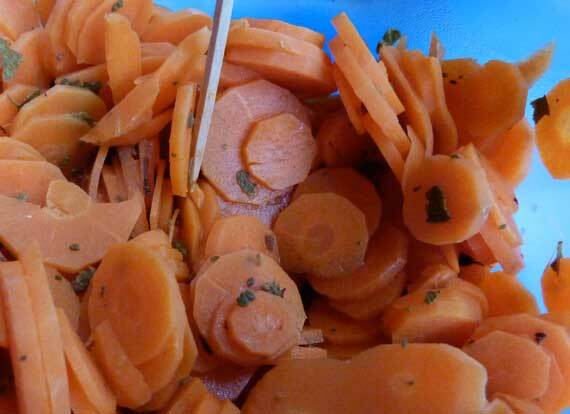 Use about 2 teaspoons vinegar per carrot. Add some oregano. I use dried Mexican oregano, which has a slightly different flavor than the more common type. I use perhaps a quarter teaspoon per pound bag of carrots. Swish the oregano in the cider until it begins to rehydrate. Add some salt. Add the carrots to the liquid and let them marinate. On the counter is okay if you’ll be serving it later that day. Otherwise, probably in the fridge is wiser. Serve on a saucer with toothpicks, if with beer.